A few weeks ago my cousin Beth suggested that I sign up for Instagram and start using it to share my Weekly Fifty pics. I had thought about it in the past a few times, but to be honest I rather like engaging with people right here on the blog instead of Instagram. One of the best parts of this continual photography project is the comments from people on each blog post, and I think this is a better platform to foster engaging back-and-forth dialogue than Instagram. And yet, Beth’s idea intrigued me. She suggested I use it as a platform to essentially bring people to the website, and that seemed like a compelling proposition–enough that I actually did sign up for an account which you can check out here. Basically all I’m doing there is posting the same picture you see on the website each Wednesday along with a few hashtags. Nothing special, but at the same time it’s kind of fun to have another outlet on which to share some of these 50mm pics. So what does that have to do with this picture of a couple shoes? Well, what I soon found out after setting up an Instagram account is that I’m spending more time looking at more pictures than I used to. Seriously, most of the photographs I see on a daily basis are families and kids on Facebook whereas on Instagram there’s more of an artistic bent to the images being shared along with hashtags to help categorize everything. All this has been a bit of a revelation for me and I have found myself simply looking at photos more than I used to and, consequently, getting ideas for pictures of my own. 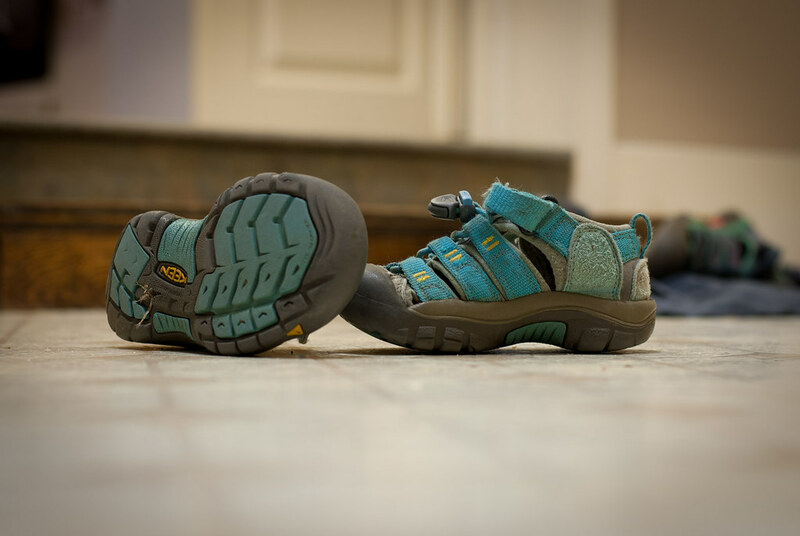 This image of a kid’s shoe on the first day of school got me thinking: I have kids of my own, and I should try taking a picture of their shoes. So I went over to our entryway early in the morning before my boys got up, sat my D200 on the floor, and took the picture you see at the top of this post. I hope the worn and tattered light blue fabric captures not only a bit of the spirit of childhood playtime, but a sense of calm and comfort as well. I shot this at f/3.3 to get a little less bokeh, which meant I needed a longer shutter of 0.3 seconds given my low ISO of 100. On a side note, I like how the Instagram pic was also taken on a crop sensor Nikon D7000 with a 50mm lens, but I didn’t even realize it until I was writing this blog post. Yay for 50mm prime lenses! Reminds me of my boys; play hard, play on! Yup, you got that right Lisa! I absolutely love your picture of your boys shoes! And thankyou so much for using one of my pictures from Instagram.. My 50mm lens is on my camera 90% of the time…. Love how you explain the process of taking all your pictures! Yes! Yay! For the 50!! Jill, this is me sending you a *fistbump* from one 50mm fan to another :) I really enjoy seeing your photos on Instagram–keep up the great work! I like all you pics, and i wonder why you are using 50mm most of the time. I have 50mm but i use it just for portraits only. Good question, and I’m glad you asked. It all goes back to when I got my first DSLR, a Nikon D200 several years ago. Like most people I wanted to get a kit lens because it zooms in and out, but my friends (who were, and still are, much better photographers than me) convinced me to get a 50mm f/1.8 lens instead. That choice made all the difference in the world, and opened my eyes to the enormous potential my camera held that would have likely remained unexplored if I had a kit lens. I started this blog about two and a half years ago as a way to hold myself accountable for taking more photos and not let my camera sit around gathering dust. Even though the 50mm is not my most used lens, having this blog does challenge me to get out and shoot more photos and use the limitations of that lens as an advantage. What a great idea to use Instagram for ideas instead of posting pictures! I am not big on signing up for something just because it is the thing to do but I can always use ideas! Look forward to your posts every week. To be honest I never thought much about Instagram either until I realized I could simply use it to follow people and get ideas and inspiration for photos. I have since found that I like posting to it as well, but even if all you do is join so you can look at other people’s images I think it’s probably going to be worth your time. First, is the perspective of the shooter. Right down on the floor with the shoes! Much more effective than if taken standing up. Second, is the bokeh in the background. Shot at f/3.3 to give SOME definition to the items behind the shoes but, still sufficiently out of focus to put the emphasis on the shoes. Nicely done! I would have shot it at f/1.8 or 1.4 and washed everything out. But, I see now that there is another option for us to consider when taking our photographs. You are good! Thank you putting the effort in to having this site. You’re right about the perspective, though I must admit my choice of viewpoints was somewhat guided by necessity: I knew I had to keep my camera still, and the only way to do that without getting out my tripod was to set it right on the floor. I actually did take a few shots at wider apertures for greater background blur, but decided not to use them because it obscured things just a bit too much for my liking. It’s all up to the shooter though, and in the end I still prefer the original Instagram pic over the one I posted so maybe I’ll keep trying to see what I can do to emulate it. Your site gives me inspiration every week! Thanks. I have had my 50mm for ages but am only now seeing that it really just ‘does the job’ – no fuss, no bother – just so well! Am now off to Instagram to ‘follow’ you! Amazing inspirstion tbere for sure! I like the blue color on the shoes and the fact that one is right side up and the other on its side. Our daughter ran cross country. One of my favorites of her senior pictures shows her sitting, encircled by all the pairs of running shoes that she wore.